After the very successful Blogapalooza gathering last month wherein the bloggers and business men met, When In Manila, the famous blogging community now spearheaded another huge gathering. This time, it's an exciting Christmas party for the bloggers! 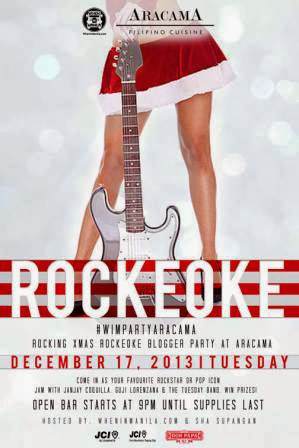 The Christmas party is dubbed as Rockeoke Bloggers Christmas Party! WhenInManila.com writers, photographers, partners, sponsors and friends, as well as all the bloggers out there is invited to attend the party at the hottest spot in Manila today, in Aracama Bar, The Fort, BGC, this coming Tuesday, December 17, 2013. Rockstars namely Guji Lorenzana, Janjay Coquilla, and the Tuesday Band will be coming over to party with the bloggers and other social media personalities. Aside from this, cool and great prizes await to the bloggers and guests that will come in their best rockstar or pop icon attire! The event is hosted by WhenInManila.com, Sha Supangan and JCI Fort Bonifacio. Megan Young is People Asia's People of the Year!